What city first started the Mardi Gras tradition in the United States? Ask someone from Louisiana, Alabama or Mississippi, and you may get three very different answers. In Alabama, folks take great pride in naming Mobile as home of the original Mardi Gras celebration in this country. Though many people associate Mardi Gras with New Orleans, an official celebration began in Mobile in 1703, 15 years before the first one in Louisiana. Mobile held the first masked ball in 1704, and the traditional parade got its start in 1711. 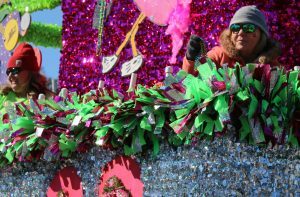 Now that you’ve got the dates, start scheduling your Mardi Gras vacation to take in several of these bead-throwin’, jazz-playin’ parades.